The History of the United States II: 1865 to the Present examination covers material that is normally taught in the second semester of what is frequently a two-semester course in United States history. The examination covers the time of United States history from the end of the Civil War to the present, with most of the inquiries being on the twentieth century. The examination contains around 120 questions to be replied in an hour and a half. Some of these are pretest inquiries that won't be scored. Whenever competitors spend on instructional exercises and giving individual data is notwithstanding the genuine testing time. Questions on the History of the United States II examination require candidates to demonstrate one or more of the following abilities. 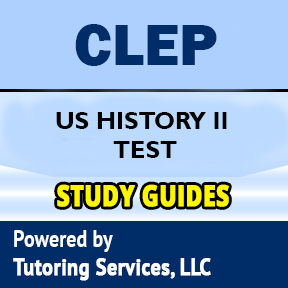 The subject matter of the History of the United States II examination is drawn from the following topics. The percentages next to the main topics indicate the approximate percentage of exam questions on that topic. SELECT a.id, a.book_title, a.description, a.ad_image, a.image_tag, a.isbn, a.asking_price, a.book_condition, a.book_store_url, a.sg_type, a.url_path, c.subject_id, c.subject FROM tbl_used_book as a, tbl_booksubject_description as b, tbl_level_subjects as c WHERE a.exam_code = "clep-us-history-ii-exam-description" AND a.subject_id = b.subject_id AND a.subject_id = c.subject_id AND a.is_available = "1"